It's that time of year again. Time for boxes of chocolates and adorable heart necklaces. I just want to remind you to be safe. Chocolate is extremely toxic to dogs' systems, so be safe. While your little Yorkie, like Buddy here, may not be able to get the box off your kitchen counter, your Lab or even a Border Collie may surprise you at their wiley ability to nuzzle a box to the edge. Another word of caution, even through thoroughly wrapped in plastic, those chocolates can still be readily detected by your dog. And he doesn't have to be a hound to find them. Place the candy well out of reach of your largest dog, and hide the jewelry right along with it. Hopscotching around your yard to locate a charm or necklace that has been eaten will not be fun! FYI, if you do have an incident with the chocolate, be sure to contact your vet or poison control immediately. This link takes you to a sub-page on my site that has loads of emergency resources for situations like this. It couldn't hurt to print it and keep it somewhere accessible. You'll also find it located on my site under Emergency resources in the lower part of my sidebar. Tuck that in your memory bank for future reference. 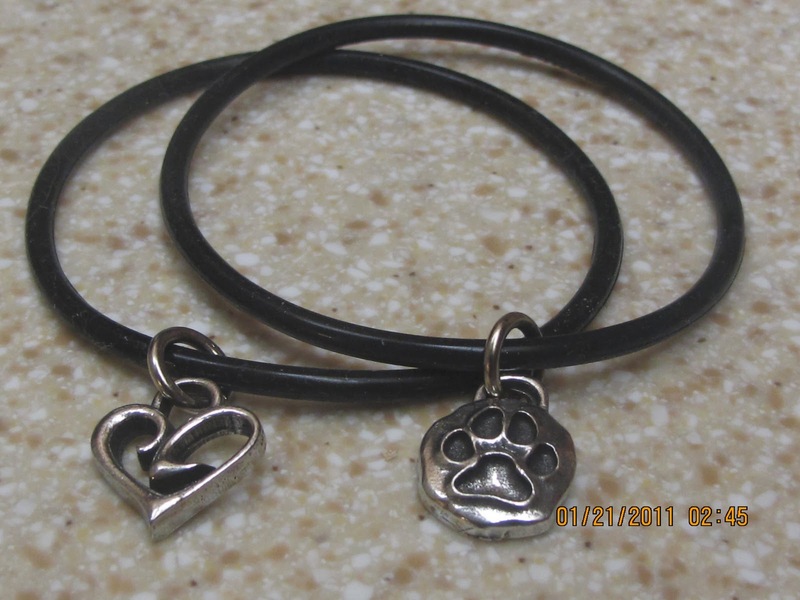 On a lighter note, hows about we give away a couple of adorable bracelets for some of you Valentine fans? My friends over at Freaky Dog People sent me these precious bracelets, and I just have to share! Comments here and on my Facebook page will get you an entry. I'll award both bracelets to two lucky winners on Friday, January 29. That will give me time to get them to the winners before Valentines Day. A bracelet will make a nice addition to that box of candy! Just a little reminder...Our drawing entries each week are rolling. That means that once you're entered, your name remains in the pot until it is drawn. It also means that someone who doesn't enter this week may be this week's winner. I just wanted to reiterate my weekly drawing methodology. You may enter as often as you wish. Good luck! Speaking of drawings, it's time to announce the winner of this week's prize, a CD from Through a Dog's Ear: Music to Calm Your Canine Companion. Mary Lou Rousseau, come on down! You're today's winner from our pot of rolling entries. Thanks to everyone who entered, and remember--your name is still in the pot for our weekly giveaways. Keep entering to raise your potential for winning. Oliver seems to have taken a fancy to the pawprint bracelet. I suppose it would fit him like a necklace, but I doubt if it was intended for a dog. It's more of a dog lover gift. He's moping over at 5 Minutes for Fido. Poor fella! I love Freaky Dog People. Their stuff is awesome. Thanks for the giveaway. And thanks for the reminders about chocolate. My dog gets into pretty much everything if we are not careful. She is a born scrounger. So are always extra careful to not leave anything out, not even on the counter. Because you just never know. The bracelets are awesome!! Love to win one. My sister's rat terrier/chihuahua mix ate a box of chocolate over the holidays. He was miserable for days and almost didn't make it. But he did. His name is Lucky for good reason. 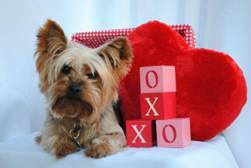 Watch for a carob recipe on Valentine's Day that is dog-safe. I WORK AT A VET CLINIC AND WOULD LOVE TO WEAR THESE BRACELETS TO WORK THEY ARE REALLY COOL!